He explores this theme in a variety of ways in the pieces on display at Monique Meloche. 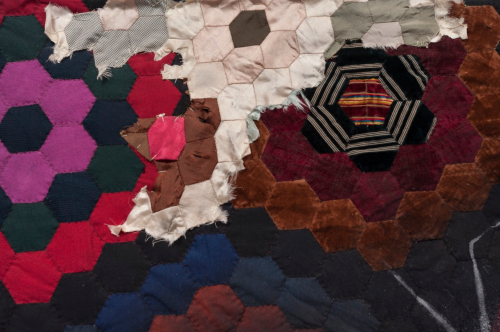 On the walls hang vibrant and multifaceted textile pieces. 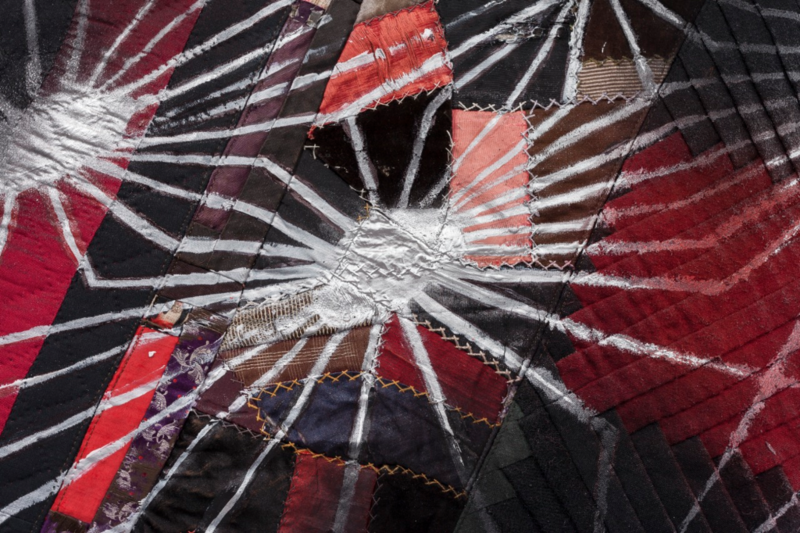 Acrylic and spray paint overlay strata of fabric, serving to color, complicate, and amplify the material on which they are placed: historic quilts from the Underground Railroad era. Native to Los Angeles and New York-based, Biggers credits Chicago for furthering his prolific career. “I went to the Art Institute of Chicago for my masters, and I’ve debuted in Chicago several times over the last fifteen years, and I’m also one of the Board Members at the School of the Art Institute of Chicago,” he said. 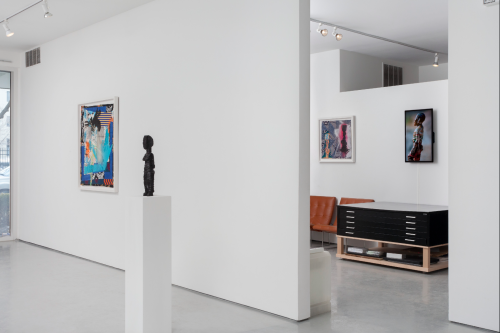 Local artists, including Brian Sikes, Kerry James Marshall, and the late Ray Yoshida, had a significant influence on his work. 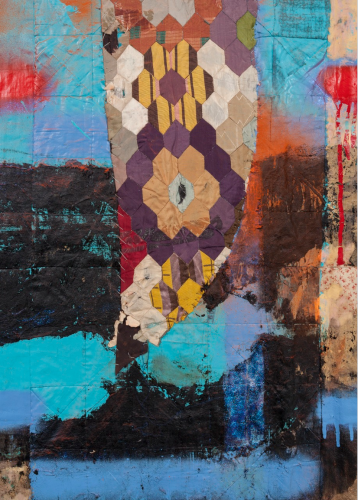 At “the pasts they brought with them,” Biggers’s piece “DAGU” zig-zags across the wall. It is named after the communication system used by the Afar, a migratory people of northeastern Ethiopia. 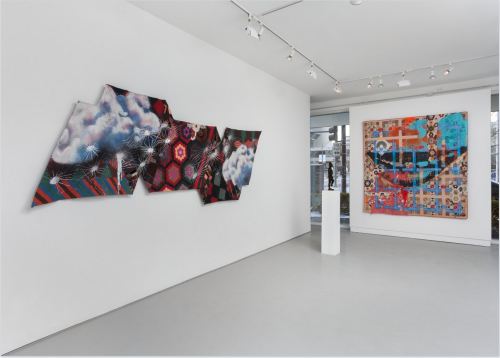 Comparably, the elements of “DAGU” interact and inform one another; strips of hand-stitched, geometric fabric fragments bind the antique quilt pieces together, embellished by spiderlike metallic paint splatters and colorful yet ominous clouds. 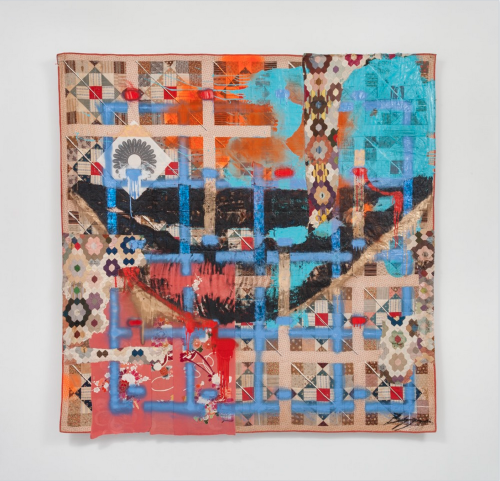 The other larger textile piece, “Hat and Beard”, is a true amalgamation of several of the exhibition’s overarching themes, speaking simultaneously to racist disguise and obscured identity as well as cultural fusion and temporal overlap. 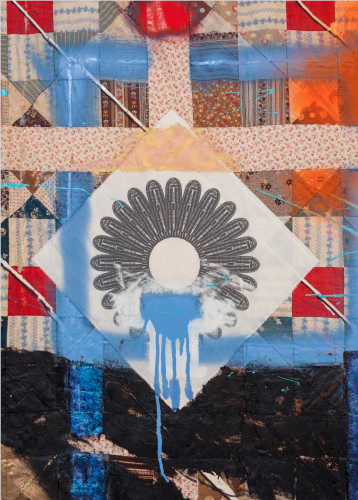 This idea of masking manifests in the layers that compose the surface of “Hat and Beard.” Most prominent is the centered outline of a smiling pair of lips in thinly painted black, encaged in a cobalt blue grid that mimics the original antique quilt’s grid-like pattern. The lip shape, which has been a motif in many of Biggers’s previous works, alludes to both the disappearing figure of the Cheshire Cat and the demeaning blackface makeup of minstrel show players in the early nineteenth century. “For Michael” and “For Sandra” are bronze replicas of the altered wooden effigies, stained with a dark black patina. Missing chunks and bullet holes mar the feminine figure of “Sandra”; notably, her face and left arm are entirely severed. Similarly, “Michael” stands somberly on one leg; his other is merely a stump, and a great block is missing from the back of his head. Equally as impactful as the end product of these masterfully transfigured memorials, overtly and unapologetically political in nature, is the methodical process that went into their creation. In “BAM”, this disfiguring is illustrated through a wide array of filmic techniques: slow motion, reverse chronology, extreme close-ups, rapidly varying cuts, and amplified sound. Shards of wood explode and rotate in midair as the bullets come in contact with the figures. Then, just as the video ends, “Michael’s” leg is blown out from under him, and he dramatically and pivotally collapses. Towards the end of the exhibition’s run, Biggers hopes to perform with his band Moon Medicin, which composes pieces through a process of compiling and reinterpreting clips from the past in the context of assorted cultural, geographical, and period-specific musical modes.